Bulls have a large hump and large dewlap; horns are variable in size; coat colour is also very variable; they have adapted to browsing during long dry season (Felius, 1995). In Zambia the Angoni are located between 9° and 14°S latitude and longitude 30° and 31°E, and are confined between Mporokoso and Petanke to the west and the borders with Mozambique and Tanzania to the east. This population of the Angoni is considered to be pure with the exception of some exotic influence around Chipata. The Angoni group of cattle are believed to be descendents of the original zebu introduced through the Horn of Africa. The Angoni people who descended from the Nguni tribe in South Africa maintain them. 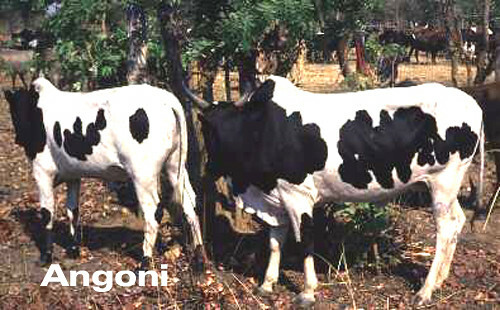 They are supposed to have lost their original Sanga cattle holdings and restored them with zebu as they wandered as far north as Lake Tanganyika, and subsequently settled on the Angoni plateau of eastern Zambia and adjoining areas of Malawi between 1850 and 1870 with what became known as Angoni cattle. They later spread southwards reaching north-western Mozambique. These cattle are today known as Angoni in Zambia, Malawi Zebu in Malawi and Angone in Mozambique (Rege and Tawah, 1999).